The Butcher family is synonymous with cricket and Alan is, quite literally, the father figure. It's funny but I always remember his first and only Test match against India at The Oval in 1979 in what became one of the great Tests. His son, Mark, may have been in the public conscience more so than his father and another son, Gary, was a decent county player. 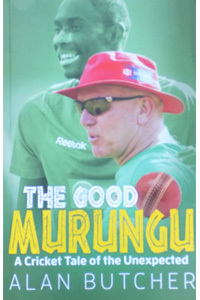 The Good Murungu, the last word meaning white man, is the time Alan spent as coach of Zimbabwe for three years. On the face of it, there are very few indigenous coaches in international cricket so I started to read the book with an open mind. His appointment as coach came at a time when Zimbabwe was about to embark upon its reintegration into Test cricket after a barren period during which they were no more than an Associate nation. The glory days were a distant memory although some of its former stars still helped out with the national side. It must be considered a brave move for a chap in his 50s to up sticks from his family and move to coach a country which was, in reality, unlikely to set the cricketing world on fire. It could hardly be called the safest country for a person to move to either. Butcher's remit was essentially to make the Zimbabwean side competitive and it sounds in general as if he succeeded. The Good Murungu grew on me, though. I and others sometimes suspect that cricketers do not or cannot always think for themselves and that cricket coverage has become so intense and long-winded - well, that could be applied to most sports - that it sometimes seems that the coach and the many backroom staff are more important than the cricketers themselves who sports fans go to watch. I may be wrong but, whatever, Alan Butcher inherited a side which wasn't allowed to think for themselves: orders were given and expected to be followed. The hierarchical system seemed to spell trouble for the players and it is remarkable that, even for a country beset by financial difficulties, that not only was there little financial incentive for the players but they were rarely paid for months. This is maybe where The Good Murungu makes for fascinating reading. Where it also comes over well is in the love Alan shows for the attractions which Zimbabwe offers tourists. He is very obviously keen on the safari, seems to enjoy a drink but maybe let's not mention driving... What his book also shows is the Zimbabwean way of life, the many reasons why tourists can consider a visit to southern Africa in general and he writes with affection. He mentions the issues which he faced both at the ground and away from it fairly and is a very readable account of his three years in Zimbabwe. There was trouble with the Zimbabwe regime: finances aside, the thorny subject of racism reared its head and picking a side appears to have been no easy matter. Despite the cultural differences, Alan’s side played its first Test back and won and, generally, kept their own for many periods of Tests and series against better countries. At an age when people might start contemplating retirement, Alan Butcher’s is as an exemplary and interesting tale from which his love of not just cricket is apparent.